Mike Burd is a professional musician who tours nationally playing bass with Maine’s own Dave Mallett. 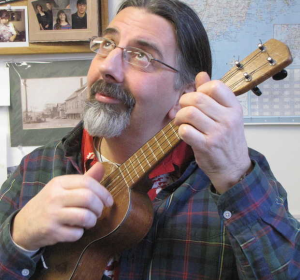 His (not so) secret passion, however, is playing ukulele and he is indeed the facilitator for the uke group The Merry Plinksters in Farmington. Joel Eckhaus says, “Mike Burd, … is one of those bass player/uke genius types..and is encouraging uke players to bring their ukes to Dave’s shows, to play along on the Garden Song…I think it could be a movement…” Mike answers he wants to “bring folk music back to the folks”. Mike will be joining the Maine Fiddle Camp staff, teaching uke, in 2015.